According to Knudson hypothesis, cancer mutations accumulate in order. Statistics says, that cancer probability increases as sixth order of age, which may mean six consequential steps to cancer. But, mutations are random in nature. There is no apparent cause, why mutations ABCDEF can't occur in reverse order, i.e. FEDCBA and any other possible orders. If unordered, any number of required mutations should cause flat age dependency. Hence, something is ordering these mutations, i.e. making mutation B impossible until A occurs and so on. The graph is not linear, which means that mutations are not independent. Let's regard some cancer, which requires 6 mutations. It's incidence distribution should be like shown above. Now let's regard only one (first) mutation. Why is it's incidence age dependent? Mutations are random. They should not depend on age. If they do depend on age, then they are not random. If "they" are not random, then "they" are not mutations. Or, in other words, the cause of progression is not a mutation itself. 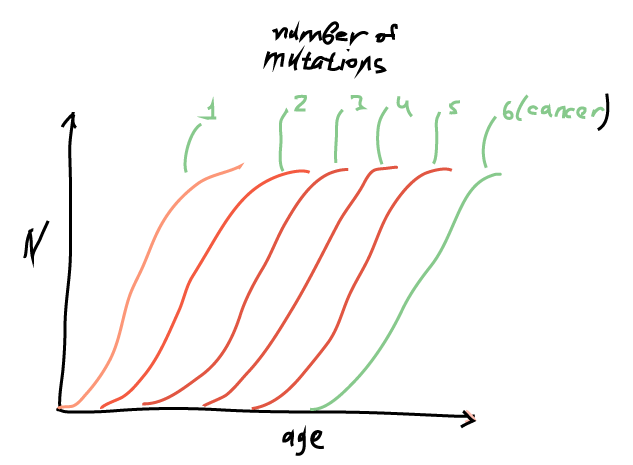 A sixth order probability curve of cancer does not mean six steps. The order of the curve has nothing to do with the number or sequence of mutations. 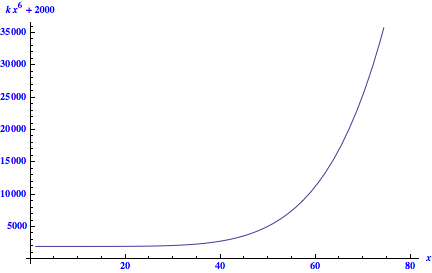 The sigmoidal shape of the curve thus reflects the slow accumulation of "defence"-damaging mutations, which increase their own probability and thus the slope of the curve. I don't know if the slight decrease in slope towards the end reflects a real limit to the incidence of cancers, or if it's an issue related to the data, its availability or the way it is gathered (but has no basis in substance i.e. there isn't actually a limit). There are many biological factors which play into helping you understand the problem you are wondering about, and the fact that different cancers work differently does not make it easier. I would highly recommend that you check out Hallmarks of Cancer, the Wikipedia article also cites the interesting original publication. Basically, certain principles underly all cancers, but different cancers have different tendencies to develop certain hallmarks in a particular order. Mutations are not random. The nature of DNA sequences affects their susceptibility to DNA lesions, i.e. damage caused by chemical processes such as a nucleotide losing its base, dimerisation of thymidine, single or double strand breaks and so on. Lesions occur all the time, so there are mechanisms in place to fix all types of DNA lesions. Occasionally however, the circumstances will permit e.g. two lesions to coincide or the repair process itself to make an error, which then leads to a permanent change of the DNA sequence that cannot be fixed anymore because the original sequence has been lost. This is a mutation, and mutations are also not random because the nature of DNA sequences affects the chancefor them to incur lesions that cannot be repaired. Hence, one reason why certain mutations occur more frequently than others is because they are actually more likely to occur. But this isn't the main reason. There are higher levels of control than DNA repair. Various mechanisms in the cell exist to detect malfunctioning proteins (due to mutations in their gene) and degrade them - though sometimes malfunctioning proteins can still escape these mechanisms. Even in this case, there is an additional safety layer created by various mechanisms which lead a cell to kill itself (apoptosis). These are triggered for example if excessive DNA damage is detected, or if the cell-internal signals for and against proliferation are conflicting. The result of repair and control mechanisms (which I will now call "defence mechanisms") is on the one hand that we are far more resistant to mutations than we would be without them. On the other hand however, they create selection for mutations which are not affected by them. This is where multi-hit models of cancer come from. A "first hit", "enabling mutation" or whatever you want to call it would be a mutation which itself is not affected by defence mechanisms - and simultaneously impairs the defence against other mutation(s). The "second hit", "initiating mutation",... would be a mutation which causes cancerous cell behaviour, but would be eliminated by a defence mechanism without the first hit. This means that mutations do not always occur in the same sequence but rather, they occur in all sequences and sequences other than those that we find in cancer cells are eliminated. Note that not all cancers have several mutations or a sequence. For example, chronic myeloid leukaemia (CML, a blood cancer) in the vast majority of cases is caused by a translocation from chromosome 19 to chromosome 22 which results in the famous Philadelphia chromosome and produces the BCR-ABL fusion gene. This single mutation is sufficient to cause CML. Mutations can affect all parts of a cell's machinery, including the lesion repair mechanisms. This means that throughout its life time, a cell can (and will) accumulate mutations which increase the likelihood of further mutations. Mature cells usually have short life spans and mutations to their DNA repair machinery die with them relatively soon (days or weeks). However, pluripotent stem cells (PSC) in the tissues are just as likely to develop these mutations as mature cells - and PSCs are the ones which renew the tissue throughout life by differentiating into mature cells. Mutations occur indeed randomly. Most of them are either repaired or the cells go either into senescence or apoptosis and will cause no harm. Some mutations are harmless while others are among the ones which can cause cancer. These genes, which are often mutated in cancers are called oncogenes and they are either mutated (permanently activated or inactivated) or misregulated (up- or downregulated, amplified etc.) in many cancers. These are preferrably genes which are involved in the regulation of cell cycle (which is usually halted if cells acquire mutations, something that the cell has to overcome), growth, division, differentiation and also apoptosis (genes which are regulating apoptosis are very often affected). These mutation doesn't have to occur in a certain order, they need to overcome some "threshold" to transform the cell. During this whole process the tanforming cell has to escape the checks of the body which eliminates these cells. Maybe your question is essentially semantic. You have I think misinterpreted the phrase "sixth order." A sixth order* polynomial is one of the form $p = k_6 x^6 + k_5x^5+k_4x^4+k_3x^3+k_2x^2+k_1x +k_0.$ The $k_i$ are constants. 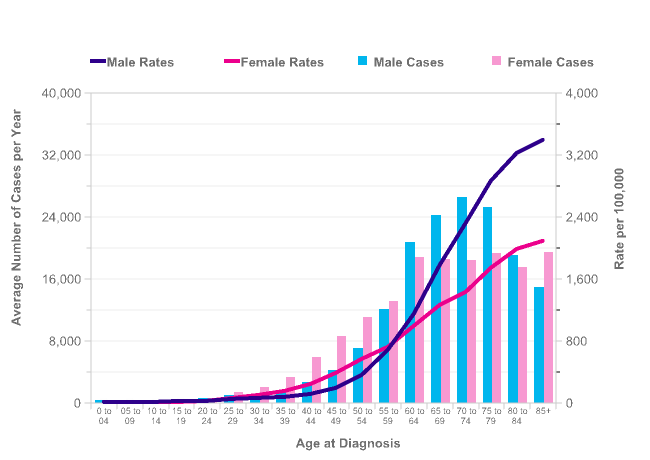 The graph caption in the first link in your post [Nordling] says that cancer mortality increases as the sixth power of age. You refer to this mathematical modeling idea in your question. This has nothing to do with the number of mutations or the order in which they occur. It simply means the trend can be modeled with a sixth degree polynomial. In the case of your graph something like $y = k\cdot x^6 + 2000$ for an appropriate value of k gives an idea. Knudson's hypothesis, also known as the "multiple hit hypothesis," says nothing about the order in which mutations occur. Edit: The word 'random' as applied to mutations (and almost everything else), while still in use, may be incorrect and I removed it from this answer. *The reference in the linked article uses the term "power." The term "order" in this context is a slight abuse of language. The correct term would be "degree," as in, a "sixth degree polynomial." Order is related to the highest degree of a set of polynomials spanning a vector space, not the topic here. The ordering is due to how the most dangerous mutations knock out tumor-suppressing genes. Assuming that mutations are random and uniformly distributed, most random bad mutations will be caught and prompt DNA repair or apoptosis. The best way for a mutation to avoid being caught is to disable DNA repair or tumor-suppressing genes. An obvious no-brainer example would be a nonsense mutation in TP53. After that, further mutations will quickly follow and bad mutations that would have previously been caught are now allowed to slip through. The 2nd other prominent source of cancerous mutations are malfunctions in cell growth/migration signaling, although the most dangerous forms of these also require tumor-suppressing genes to be disabled first. Not the answer you're looking for? Browse other questions tagged cancer mutations statistics or ask your own question. Extremely rare occurence of Heart cancer?